Nothing beats a day on the water with family and friends! We take great pride in our tours and unlike most tour companies that try to rush you out and do two tours per day, we do one tour and we do it well! 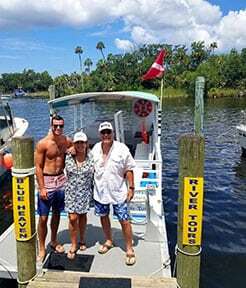 Our 6 hour tours give you the time to truly enjoy all the beauty of the Homosassa River! Yet our prices are close to the same as many the other companies 4 hour tours! Take the time to see Dolphins, enjoy the estuary, spend the extra time gathering Scallops or visit the beautiful Homosassa Springs! Our tours are tailored to what you want! Pack a lunch, bring a cooler full of drinks and let us be your designated Captain! 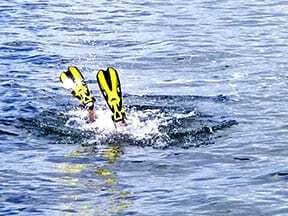 Come take part in what many call the “Giant Underwater Easter Egg Hunt” Enjoy all the beauty of the Homosassa River on our Commercially Built comfortable 30 Foot Shaded Pontoon Boat with an on-board Restroom! Our Brand-New Boat is powered by a Suzuki 95 Horse Power 4 Stroke and is built to all the coast guard regulations wiring, safety rails and equipment to assure both your comfort and safety for all your friends and family to enjoy! 6 Hour Semi Private Tours $87.50 per person! 6 Guest limit per boat! 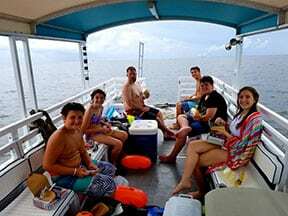 If you have more than 6 people or in your party you can add a 2nd or 3rd boat to accommodate your extra family and friends for as little as $75.00 per person! If you need to change your tour time to fit your needs please contact us and we will do our best to accommodate!!! 1 & 1/2 Hour / 3 Hour & 4 & 1/2 Hour Nature Tours and Manatee Tours are also available upon request! Visit our Website for all pricing, information and tour times or call us with any questions you may have! Ask us about our Full day fun on the water 8 hour Tour! Our tours are tailor made to what our guest want to enjoy, and we know the River and where the Scallops are! Our 30 foot comfortable shaded pontoon boat is perfect for your ultimate Scallop and River Adventure and we provide everything you need from you fishing license, fin’s masks, snorkels, safety equipment floats and more! 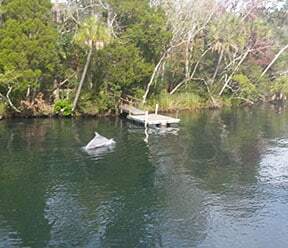 After your Scallop Adventure some of our guest choose to Dolphin Watch or cruise around Monkey Island to the Homosassa Springs where you can take a dip in Paradise and enjoy the seeing more fish, turtles and the ocasional Manatee! 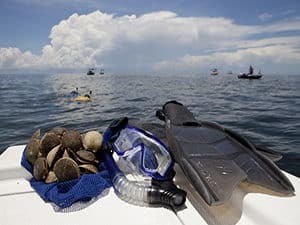 We recommend all Scallop Hunters pack a lunch and bring any snacks along with the beverages of your choice! Make sure you have some sunscreen, towels and sunglasses and it is important to arrive 15 minutes before your scheduled tour time so we can get under way on time for the what many of our guest say is the experience of a lifetime! 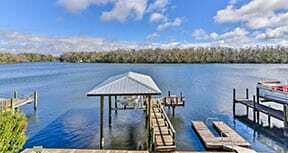 Don’t get caught on an old Pontoon Boat or Deck Boat with no Restroom! When you can enjoy our beautiful boat at a great price! See our website for all pricing, information and tour times or call us with any questions you may have! * Some Tours do have a minimum fee but we strive to keep our prices affordable for everyone and our tours simply amazing! Eco/Nature tours start at $39.00 per person and Manatee Tours start at $59.00 per person!